A couple of months ago, I asked the director of a United Kingdom think tank focused on religion and society if organizations like hers were more comfortable with atheism than with religions outside of Christianity, Judaism and Islam. She answered affirmatively, stating that a lack of faith is “more familiar” than any non-Abrahamic tradition. She is not alone in this sentiment. Interfaith most often means intra-Abrahamic. There is a shared heritage between the three large monotheistic faiths that can provide a natural starting point for dialogue between the traditions. If an atheist presents an argument regarding the existence of God, that argument is necessarily part of Abrahamic dialogue. By agreeing that the discussion concerns the immanent reality of God, the atheist agrees to terms that are innately bound to an Abrahamic worldview. The atheist and the follower of an Abrahamic tradition are part of the same conceptual world; they are arguing within a culturally bound structure. The polytheist does not agree to the basic premises of this system. For someone who shares the world with gods, goddesses, wights, giants and other powers, the concept of a single, omniscient, omnipotent God moving over the surface of the waters is as foreign as the idea of elves and spirits deciding the fate of a Member of Parliament would be to a Muslim. My own tradition is Ásatrú, the modern iteration of pre-Christian Germanic religion. The worldwide heathen community is relatively small, but it spreads across many regions of the planet and encompasses a great diversity of belief and practice. The archeological, historical and literary record relating to the roots of the religion encompasses a great variety of source materials from the past 4,000 years: Bronze Age rock carvings in Scandinavia, records of interactions between the Roman Empire and continental Germanic tribes, chronicles of heathen-Christian clashes during the Viking Age, the preservation of myths and legends in post-Conversion Iceland, and folk practices that survive into recent times. The modern revival dates to 1972, when Sveinbjörn Beinteinsson founded the Ásatrúarfélagið (“Æsir Faith Fellowship”) in Iceland. Ásatrú soon began to appear around the world in the form of national organizations, regional groups, small communities, and individual practitioners. It is now Iceland’s largest non-Christian religion, and the U.S. Department of Veterans Affairs last year approved Mjölnir (Thor’s hammer) as a recognized emblem of belief for military grave markers. What place is there for heathens in interfaith organizations? I have yet to find even one national-level interfaith organization in the United States that has a single Ásatrúar on its board, advisory panel, administration or staff. Last year, the rabbi who co-founded an interfaith journal told me that his group’s “Board of Scholars and Practitioners” (with over fifty current members) had no place for a heathen – there was simply no room at the inn. Why do organizations bother with these advisory panels full of faith leaders, then? To understand that, we need to ask what a religion think tank, an interfaith journal and a religion news organization have in common – aside from their purported dedication of openness to varied faith perspectives. There is a clear way to find the answer: follow the money. They all receive grants from government agencies, corporate foundations, anonymous donors and others who are attracted by the supposedly inclusive idea of “interfaith.” By pointing to a list of advisors from across a spectrum of religious traditions, the organizations can claim a multicultural approach that is attractive to granters. From a broader faith perspective, however, this version of multiculturalism is really monocultural. Where are the voices from outside the Abrahamic axis? Apparently, they can’t pay the price of admission. Money does indeed have its say. As the recent Hobby Lobby decision by the Supreme Court of the United States showed us, members of religious traditions that can muster cash and votes can directly influence the course of public life. Those without such assets – like the members of the Native American Church that were less successful in their own Supreme Court case – do not have the ability to break through into the nation’s dialogue on religion. Without being able to deliver large amounts of cash or numbers of voters, how do those of us who belong to small minority traditions break into interfaith dialogue? The rhetorical focus on Abrahamic monotheism and the exclusion of our communities from leadership positions seem to provide insurmountable obstacles. I do think there is a solution, but it depends on the dedication of those within existing organizations and on the level of their commitment to real interfaith work. There are two things that need to be done immediately and with sincerity. Tokenism and superficial fixes will make no lasting difference. First, interfaith organizers need to take a good look at their programming. In order to achieve a more diverse participation in interfaith events, a conscious effort must be made by organizers. In the second decade of the twenty-first century, it’s no longer enough to book an imam for a Passover celebration at a Catholic church and think you’ve checked off all the boxes. Interfaith groups need to figure out ways to take the dialogue out of the Abrahamic box and open it up to all traditions. How do members of a religious community strike a balance between adhering to ancient forms of their faith and responding to realities of modern life? How do we create a discursive space in which believers in the literal reality of a tradition’s mystical elements can engage in meaningful and respectful dialogue with practitioners who see ancient texts as cultural or metaphorical? What weight should religious people give to scholarly works on their faith written by academics who are not part of their faith – or are even hostile to it? When the perpetrator of an extremist act claims allegiance to a religion, how should members of that tradition publicly react – and how should they deal with inquiries from the media? None of these questions privilege any faith tradition or suggest that answers from, for example, a Presbyterian minister and an Ásatrú goði have different levels of importance. A forum on these sorts of issues would create a level playing field between all faiths, regardless of how many gods each one has. Unfortunately, merely asking these types of questions will not be enough to bring members of marginalized faiths to interfaith events. A sincere move must be made to bring in those who have been shut out. It may be difficult for interfaith organizers to find members of minority faiths in their region. If so, time will be well spent searching the internet for minority organizations, small groups or individuals and then reaching out personally. You may be ignored, and you may be rebuffed. It will take some time to convince people that your tune is really changing and that you honestly want to hear their perspectives on the issues – and that you aren’t simply seeking greater ticket sales or the ability to pencil the name of another faith into a grant application. This leads to the second thing that needs to be done: interfaith organizations must engage in some serious affirmative action. To pick just one of innumerous examples, the Interfaith Conference of Greater Milwaukee’s board of directors has thirty-two Christians, three Muslims, two Jews and two Buddhists. All of them are identified with an established church or religious organization. Here and in other interfaith organizations, participation at the leadership level seems linked to affiliation with an existing organization. In other words, the requirement to be part of the system is that one is already part of the system. Where does this leave heathens, many of whom are lone practitioners, worship with their families, or belong to small kindreds unaffiliated with any large regional or national group? According to the editor I quoted earlier, these boards often are nothing more than a list of names on a website. However, to the members of a minority faith who looks into an interfaith organization in their region and sees a list like that of the Milwaukee group – a list that is ninety-five percent Abrahamic and has no representative from a polytheistic tradition – there is simply no reason to imagine that they would be welcome. It’s time for the organizations to make some room at the inn, even if they think they can’t possibly fit another name into the HTML code for the web page listing their board members. If the organization’s actual leadership – i.e., administrators and staff – contains no one with a background outside of the Abrahamic tradition, there is very little reason to expect programming to change in any fundamental way. If no voice on the planning committee argues passionately for inclusion of minority perspectives or questions the inherent Abrahamic bias in the way that many interfaith events are presented, nothing will change. Now is the time for all good people of faith to fight for the inclusion of underserved communities at all levels of their organizations. Maybe you’re involved in an interfaith organization that truly is inclusive, that has really freed itself from the Christian-Jewish-Muslim dialogical track, and that has actively recruited members of minority traditions for real leadership positions. If so, hail to you! I would love to hear from you and learn how you made this needed change. Maybe you’re a heathen and think this is all a bunch of hooey, that heathens should go it alone, and that we should simply give the finger to the interfaith world that has ignored Ásatrú for so long. I respect your position and wish you all the best as you work within your own community. 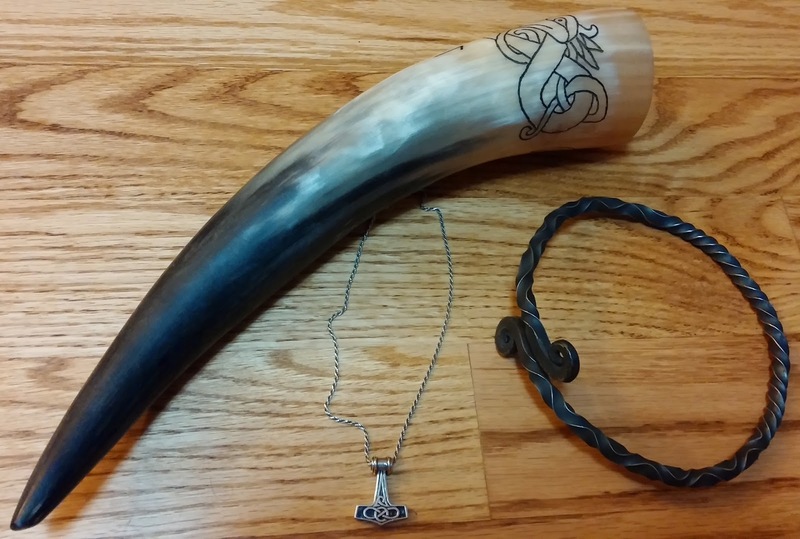 I do not claim to be a representative of heathenry or to speak for anyone beside myself. Personally, I think that including perspectives from Ásatrú – and from Dievturība, Rodzimowierstwo, Romuva, and other revived pre-Christian polytheistic traditions – can only bring new ideas and fresh perspectives to the wider interfaith discussion. If you truly support the free exchange of ideas between all religious traditions, there is no real way forward but to throw open the doors and seek out those whose voices haven’t been heard. If you believe in interfaith, it’s time to act. Dr. Karl E. H. Seigfried is the author of The Norse Mythology Blog, named the world’s best religion weblog 2012-2014. He has been a featured writer and lecturer on Norse myth at the Joseph Campbell Foundation and the Wagner Society of America, and he is the author of all Ásatrú definitions in the Religion Stylebook of the Religion Newswriters Association. He has taught Norse mythology and religion at Carthage College and Loyola University Chicago, and he currently teaches for the Newberry Library’s Continuing Education Program. Karl holds degrees in literature and music from University of California at San Diego, University of Wisconsin at Madison and University of Texas at Austin. He also studied literature and art history at Loyola University Chicago Rome Center in Italy. He recently received an academic scholarship from University of Chicago Divinity School and will begin working on an MA in Religion in Fall 2014. This is a brilliant read, We're making some inroads into interfaith work in Derbyshire, UK but have mostly found polite disinterest so far from members of the Abramic faiths. The conversations run something like this: network with other professionals connected to faith work (most recently at an interfaith Domestic Violence conference). After polite words, open conversation with an offer of long-term interfaith work. Once I politely explain to representatives and professionals that I'm a Heathen, but that not all the local pagan community is, the lights go off and they suddenly remember that they've left the gas on. It's slow going, but we've made three tentative contacts over the last year who may be willing to develop an interfaith project with us. I find it deeply frustrating that I cannot contribute to a rich interfaith dialogue and help members of all communities find commonality, rather than staying with their assumptions based on fear and a sense of inclusion/exclusion. We've posted about it recently here: http://chesterfieldpagans.org/2014/07/12/interfaith-the-beginning/ and if it's ok with you, we'd like to link to this post from the website above? Thank you Suzanne for getting in contact. I'm very glad that you're making progress and, although it's slow, that you're sticking with it. I think members of the Abrahamic faiths, myself included, become too comfortable with each other (although there are still many issues to be resolved there obviously). For me one of the main issues if that I just don't know anyone of other faiths (yet) and so I absolutely agree with Karl that we can't simply speak about inclusion, we need to actively go out and find people from other faiths and make connections ourselves rather than waiting for people to come to us (when they may feel intimidated or even unwelcome). The blog you sent was very interesting and I'm very intrigued to know what happens next - I'd love it if you could keep me informed. Yes, you're more than welcome to share the link on your site (unless I misunderstood in which case, I would be happy to link to your blog from here). Bravo! Bravo! Bravo! I have now shared this with the Interfaith Partners of South Carolina listserve and social media. I would say that we are in the group of fortunate ones who have a more than Abrahamic perspective. Many are still uncomfortable, however, with acknowledging that everyone does not worship the same god by many different names. After serving on the board for five years now in a leadership role, I am more persuaded than ever of the vital importance of our work. Recently the southeast regional director of community relations for the Dept. of Justice visited us (a follow-up to the Charleston shootings) and pointedly announced that interfaith work in many cities has literally saved lives (e.g., Murfreesboro, TN), and that we were the ones who should be featured on CNN! If anyone would like to connect with me to talk about what you are doing, or would like to do, in your community, I invite you to contact me offlist.